This no-bake cheesecake was made before the baked one actually. The weather was steamy hot the other day. So I made the no-bake cheesecake to help soothe the heat. Yet, it’d be a perfect, classic dessert after dinner, no matter how the weather is like, if you’re a lover of cheesecakes. It’s easy and quick to make. You can get it served straight from the fridge. Put the digestive biscuits in a sealed plastic bag. Crush to crumbs with a rolling pin. 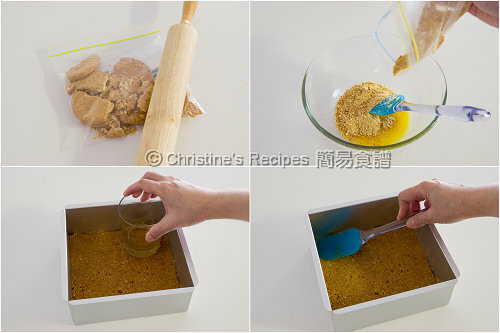 Transfer the crumbs to a bowl. Pour over the melted butter. Combine well. Place them into the tin and press firmly with the bottom of a cup to create an even layer. You might need a spoon or spatula to help when pressing for the 4 corners of the tin. In a large mixing bowl, beat the cream cheese, sugar, lemon juice and vanilla extract with an electric mixer until smooth. Use another mixing bowl, beat the thickened cream until fluffy and smooth. Stir into the cream cheese mixture and combine well. Spoon the mixture onto the biscuit base. Use a spatula to level the surface. You might like to smooth the top of the cheesecake with the back of a spoon damped with water. Chill in freezer for at least 5 hours, or until completely set. Transfer it into fridge for about 2 hours before serving. 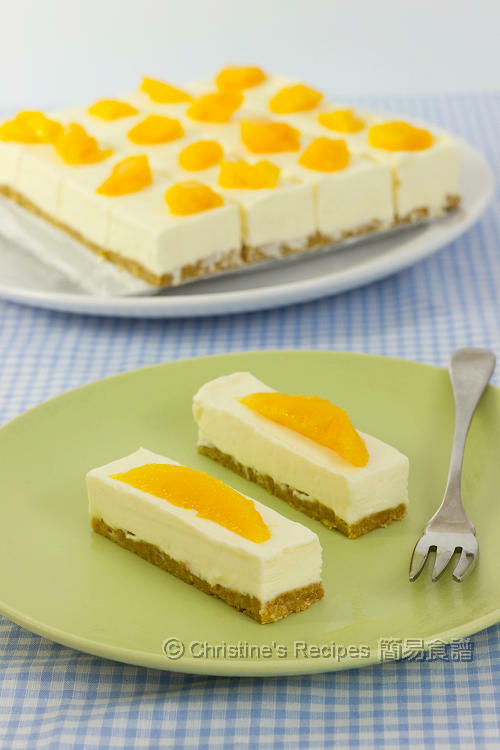 Slice into pieces and garnish with fresh mango slices, or any fruits in season. You can use either unsalted or regular butter. To get a very smooth surface of your cheesecake, try to use a damped spoon for the final touch, as the cream cheese mixture tends to stick to the spatula. Tks for the recipe but noticed that no gelatin is required in this recipe and so wonder the cheese will set. Yes, I didn't use gelatin. So the cheesecake was put into the freeze to set properly. Suppose that all the ingredients you measured and steps were right, your cake might haven't chilled enough. Simply refrigerate it longer or put it in a freezer for a bast chilling. It look gorgeous...I bet it must taste heavenly delicious too. This looks easy enough for me to try :) have always wanted to make a no-bake cheesecake, but never gotten down to it yet. Really love your food blog. It has inspire me a lot. My first baking is your Japanese Cotton Cheesecake. Is easy to follow and the result is fantastic. I m staying in BNE as well hopefully one day can meet up. I have cook some of the dishes for dinner too. Is yum and easy to follow. the tip about using a damp spoon at the end was very useful! i always have a "rough" looking cheesecake because the spatula doesn't work. because no gelatin is used, will it melt or soften very quickly at room temperature? Yes, if the weather is too hot, the cheesecake will melt. You might have noticed that the edge of my cheesecake started to melt when I took this photo, because it's steamy hot on that day. Sure, this creamy and rich cheese cake is always a perfect end to dinner; you make everything looks so simple. How do you get the cake out of the tin so perfectly...and could you add gelatin so that the cheesecake wont melt? I chilled the cheesecake in freezer until it's very firm. Then cut it by a sharp knife. Yes, you can add gelatin if you like. Chill in freezer, transfer to fridge...may i know chill in freezer means i put it in the part where i keep my ice cream, which is normally on top (some refrigerator hv it on the bottom)? Yes, frozen in the freezer where you keep ice cream and ice, then transfer to fridge 1 to 2 hrs before serving. Hi Christine.....its easy to make this cheesecake...i have added extra 20g cheese....when i take out from the fridge to cut, it turn to melt fast..may I know why it will melt? What makes the cheesecake set is chilling, not the cheese. If the weather is too warm, the cake will melt very quickly. You might try putting the cake back in freezer for a blast chilling if it starts to melt. You might use a balloon whisk. Yet it's quite tedious to beat by hand. I used Coles' thickened cream. It's not expensive. I was wondering is it okay if we add in oreo? will it blend well with this cheesecake recipe? and how much oreo will be good for this recipe? Thank you so much! Sure, Oreo will work too. Actually, I have another cheesecake recipe using oreo as the base. If you follow this recipe, try replacing the same amount of digestive biscuits with Oreo. Hi Christine. 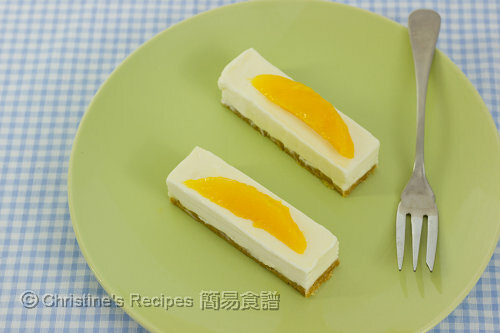 I like the idea of cutting the cheesecake into bite-sized pieces for serving after dinner. How do u get it out of the tin? Do u turn it upside down? My tin has a removable base. I just ran a knife around the edges of the cake, pushed up the base, then I could easily remove the cake from the tin. Hi Christine, I just tried your recipe and had the cake in the freezer overnight. I transferred it to the fridge 2 hours before serving but it was already melting by the time I finished cutting. Is it supposed to melt so fast? Other than the melting, the taste is good as I also made some strawberry sauce to dribble over. If the weather is quite hot. You don't need to transfer to the fridge, just serve straight from the freezer, and wait for a while before eating. Hi christine.Can i replace the whipping cream with gelatin? Feel free to experiment with whatever method you like. Can I use normal sugar instead of caster sugar? Yes, you can. Caster sugar is very fine that will be easily dissolved and mixed with other ingredients. If you have a food processor, you might give normal sugar a whizz in it and make your own caster sugar. If we freeze the cheesecake, will it become like ice cream texture? I freeze the cheesecake before, but it become like blended ice thought I had transfer it to the fridge few hours before serve. Please see step 4, "Transfer it into fridge for about 2 hours before serving." The cheesecake will be softened a bit but not icy. It's very creamy actually. I often use unsalted butter to make dessert because I can fully control the amount of the salt added. You can use salted butter, yet salt-reduced ones will be better. Hi! Can I omit the vanilla Essence? Thanks! You can omit it if don't have any. It only adds some fragrance, won't affect the texture. May I know the whipping cream that you use is heavy cream? Heavy cream or thickened cream will work too. I used heavy cream. The most crucial part is to freeze the cheesecake long enough until it sets. Supposed that your cheesecake was frozen, it shouldn't melt so quickly. Not quite remember the brand. I used heavy, thickened cream. May I know the size of the tin? Already written in the recipe. I used one 17.5cm loose-based square tin. If we are adding gelatin at the end, will the cake won't melts so easily? I am going to make it as a birthday cake to my friend. By add some gelatin, it will help to set the cheesecake. But you still need to chill it properly, it melts otherwise, not too quickly though. Hi christine, how much gelatin we will add with this recipe? For this recipe, 2 to 3 teaspoons are enough. Test 2 tsp first to see if you like the texture. 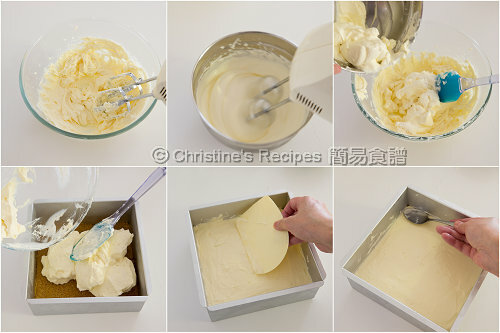 Hi christine, when you combine whipped thickened cream to cream mixture, do you fold in like you do with chiffon cake or just stir in to combine, no need to worry about deflating any air bubbles right coz its non--bake?? Hi Christine, do you happen to know why my crust stick onto the removable base? It is almost impossible for me to take the whole cake out. Suppose that the base of your cake was not wet nor with less butter. And if your baking pan is non-stick or lined with baking paper, it'd be easier to remove the cake. Hi Christine, thanks for your reply. Do you use baking paper? Perhaps next round I shall use baking paper. I didn't need to use baking paper as my cheesecake didn't stick to my pan. If you find your cake sticks, you should use. Thanks Christine. It works now. I used Paul's thickened cream and realised that gelatin is one of the ingredients. Yes, thickened cream has already got gelatin mixed inside. So, that's why you don't need any extra. Will this melt easily when I take out from the fridge? If the cheesecake is not chilled enough and the weather is too hot, it'll melt easily. Do i mix gelatin with cream cheese or i dissolve it with little bi of water? If you don't use thickened cream, then mix some melted gelatin with the cream cheese then. It's easier to set the cake. will my cheesecake melt at room temperature if i use gelatin? If you use gelatin, the cake won't easily melt. Btw, the thickened cream yielded in this recipe has got some gelatin inside already. If the cake was kept in room temperature for three hours after chilled, then chilled again completely, ll it affect the texture and quality of the cake? The taste won't be affected very much. But if the weather is too hot, after three hours at room temperature, I'm afraid the cake will melt away. If you can chill it again before melting, the texture won't be very different. Is there any way that can be done to slow down the process of melting? You may put your cheesecake in an insulated bag with one or two coolants inside. This will help to slow down the melting process. What shld I do ? Can give me some advice ? Hi, may I know how much Gelatin should use if I were to add into the recipe? And where can I get it? Oh well... If you added more butter than the recipe required, or pressed the biscuit crumbs too hard, the cheesecake base will be very hard. I haven't tried this product.